The list of things that you can cook in a Dutch oven is virtually endless. It is easier to list the things that you can’t—or shouldn’t cook—if there are any at all. Some of those things you will find out the hard way. My forever creative father was in charge of dinner one night. Instead of planning out a meal he just started throwing things into the Dutch oven. When we opened the lid we were treated to potatoes, carrots, onions, mushrooms, and soggy strips of bacon. The meal did not go over very well with my mother. Bacon is one of those things that may cause a problem in your Dutch oven. However, many recipes call for bacon cut into small pieces and it does just fine. You really can cook just about anything in a Dutch oven-- use the Dutch oven as a frying pan and fry your bacon first. A well-seasoned Dutch oven will give any food a wonderful taste that you can’t get elsewhere. Mike Audleman has written a wonderful book on Dutch oven cooking for the Boy Scouts of America. You can view his book at macscouter.com/Cooking/DutchOven.html. If you are going to dive into Dutch oven cooking this is a wonderful place to begin. He describes what you can cook in a Dutch oven in the following paragraphs. Cooking techniques such as roasting, baking, simmering, stewing, frying, boiling, steaming, and many others are easily done on the campfire with only a single utensil, the Dutch oven. Think of the possibilities, delicious fresh baked bread that will rise up and lift the lid, cobblers made from berries picked fresh at the campsite, incredible deep-dish pizzas, stews, quiches that melt in your mouth, Cornish game hens roasted to perfection, and imagine a chocolate cake a foot in diameter. These and many, many more are very possible and sometimes easier than they are at home. With very few exceptions, I have been able to duplicate my home recipes on the campfire using the Dutch oven. 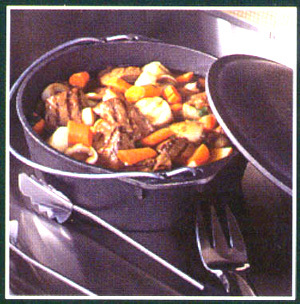 All recipes use one of two Dutch oven techniques, cooking with your Dutch oven or cooking in it. The first is when the food is placed directly in the bottom of the Dutch oven. In the second method, food is placed in a second dish and this dish is then placed onto a trivet in the bottom of the Dutch oven. The reason for the trivet is to elevate the dish above the bottom of the oven to prevent burning. As you can tell Dutch ovens are quite versatile. By using the trivet inside the oven you can get pretty fancy and creative. Dutch ovens aren’t just for “goulash” meals. You really can cook just about anything in them, even pizza. Unroll the crescent rolls. Line the bottom of a 12" Dutch oven with a layer of flattened crescent rolls. Sprinkle evenly with sausage, bell peppers, hash browns, green onion, and cheddar cheese. In a medium bowl whisk together eggs, milk, salt and pepper. Pour egg mixture evenly over top of pizza. Sprinkle with Parmesan cheese. Cover and bake using 8-10 briquettes on bottom and 12-14 briquettes on top for 20-30 minutes until eggs are set.